Donna Davidson has overseen project development efforts for dozens of BRC Imagination Arts projects including the award winning Abraham Lincoln Presidential Museum, Information Communication Pavilion at Shanghai Expo 2010, Abbey Road Studios and the Museum of Liverpool. Donna joined BRC’s Burbank office in 1998 and relocated to the UK in 2001. Her current title is Global Project Development Director. Before landing at BRC, you worked with other prominent companies, including Jack Morton Productions and Iwerks Entertainment in the Don Iwerks days. How did the transition unfold? I met Bob Rogers, founder of BRC Imagination Arts, in 1993. With Iwerks, I was involved in 5 corporate pavilions for Taejon Expo 93 and we hired BRC to do the film “Postcards” for the Korean Airlines Pavilion. Family stuff took me to the UK. My husband is an academic and we were both traveling quite a lot. I got pregnant, and he got a position, and it was time to settle down. It was a hard decision but it was one of those things where you have to put family first. When I left BRC I thought that was going to be it, but after about a year Scott Ault, the former COO of BRC and previously managing director of BRC’s Amsterdam office, recruited me to work for BRC in the UK. It worked really well. Because of the knowledge I had from working with Bob and the team in Burbank, I knew what we could bring to the market, and I had relationships with BRC’s people in Europe. Oftentimes people we need for projects in Europe are based at company hubs in the UK. How do you juggle the multiple time zones on international projects? Who’s going to be the unlucky one to get the 2:00 am slot on the conference call? But there’s also a good side: when the client and the design team are in different time zones you can have a double or even triple shift keeping the process going. One group is working while the other sleeps. This came into play on a project we were working on for SAIC and GM with Dentsu, where the work was passing between Shanghai, Los Angeles and Tokyo. We turned around in 3 days something that had been expected to take 2 weeks. “The world is flat!” said the client. When we were working on projects for Shanghai Expo 2010 – including some concept work for SAIC and GM, and design/production of the Information and Communications Pavilion sponsored by China Mobile and China Telecom – Christian Lachel flew from LA to Shanghai, and I flew from London to Shanghai, and it was the same distance for both of us. I spoke at a conference not long ago, where there was real-time participation from people in 6 different time zones – some attending in person and some as avatars. It must have been nice to work on the Museum of Liverpool, in your own backyard. A great project like the Museum of Liverpool can happen anywhere, but yes, it was wonderful to be so close to the client. I went to the opening July 19. Yoko Ono was a guest star; she’s supporting the project, which is fantastic. They got the licensing to play Beatles music, and Paul McCartney’s brother Mike had a photo exhibition and was there. Over 12,000 visitors went through the door on the first day, and more than 150,000 guests came in the first two weeks. The Museum of Liverpool is England’s first National museum in 100 years, her first purpose built museum in 100 years as well, and her first National museum about a city. The collection is from the Museum of Liverpool Life that was shoehorned into a very small old Pilotage and Salvage Association building on Liverpool’s waterfront. It was one of a half dozen museums operated by National Museums Liverpool. And because it is a National museum it is free to everyone. How did the Liverpool project come together? Like many, the Museum of Liverpool started off as a very complex project. Every client faces so many initial challenges: vision, fundraising, determining a site, political and government support, and more. BRC has experience at every stage of bringing a world-class museum to life, so we were thrilled to be part of the process from the get-go. At one point the Museum of Liverpool was going to be incorporated into a new waterfront development called “The Cloud,” but the local government decided against it because of skyrocketing costs. 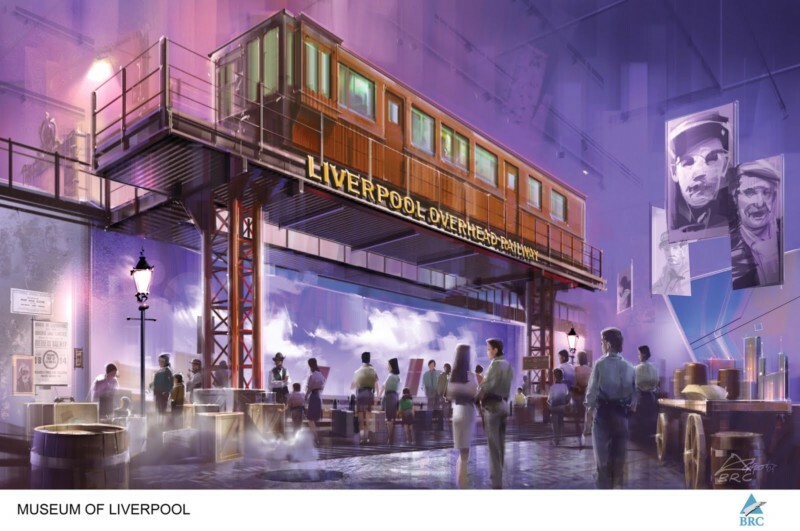 They had the site – a world heritage site next to the Three Graces, three prominent and iconic buildings on Liverpool’s waterfront – and David Fleming, who took over as director of National Museums Liverpool in the early 2000s, wanted to build something for Liverpool’s having been designated Cultural Capital of Europe in 2008. David is a social historian himself, and he wanted to create the ultimate city history museum. They had some money from the Northwest Development Agency and from the European Development Fund, and BRC helped write the brief for the Heritage Lottery Fund. There were several big files to submit – it took a lot of detail to convey how rich that collection is. The funding kick-started it and the architect, Danish firm 3XN, was chosen by international competition. Then the client launched the tender process, and BRC tendered for the exhibition master plan. How did BRC coordinate with the architect and the curators to get the design underway? This is where hiring an experienced master planner shows its value. The client wanted the most flexible museum ever, to be able to stay relevant, change stuff out, and accommodate traveling exhibitions. The architect needed to get going. But nobody yet knew what would be inside the building. BRC had to come in and really quickly figure things out: what would people do the minute they come in, reception, disabled access, freight elevator size, all that kind of practical thinking, and we gave that information to the architects to work on while we figured out what the story was. We interacted with a great team of curators. Liverpool has a 700-year history. In addition to the Beatles and football legacy, for 400 years it was one of the biggest global ports in the world. It was our job to think about how to address all these stories, and be able to change them out, and have a quality presentation – and to fit out the museum for technology down the road. Concept design and tech design were happening side by side; we worked very closely with then-show systems manager Tom Tait and project manager Josh Cottrell from BRC’s Burbank office – and many others. This was going to be a museum like none other ever built in the UK, but the quantity surveyors were basing their cost estimates on a basic museum, and we had to address that, too. For instance, the engineers were thinking of standard HVAC, and to demonstrate what was really needed, we had to do mockups to show the heat load of immersive theater systems. They were used to more standardized projects, but people hire BRC to be out-of-the-box, and David Fleming is a visionary. Liverpool is a very emotional city: the people are welcoming and take everything to heart. Absolute integrity of presentation was a must. Part of the mandate was for the museum to feel truly inclusive – there could be no elitism. Addressing this included working with a disability expert. How did BRC as master planner ensure a meaningful handover of the design brief, especially considering that this was no standardized project? BRC Imagination Arts completed its master plan in 2007. We worked with National Museums Liverpool to write those briefs, and they had key storylines that needed to be achieved. Exhibition designers Redman Design and Haley Sharpe Design have created the galleries as visitors see them today, in close collaboration with the National Museums Liverpool team, working from the master plan. The gallery directors followed the briefs that we wrote. They might have used some different techniques than if we had been involved in production, but the intent was there. The key is always to make sure that the strength of story comes through and that whatever technique we use fits within the budget guidelines. Pricing on technology is always moving so it is difficult to do that and you’re always juggling. For Liverpool, we couldn’t do immersion everywhere – we had to pick key stories (Beatles and football). We gave them technology that we knew worked and would work down the road. Our master plan encompassed the whole of the visitor experience – how do they flow and how the structure supports that – how you pulse people and avoid congestion. We even worked with the architect about where the toilets were going to go, and addressed wayfinding both inside and outside the museum. We sketched out a 5-year program of what to change out when, and where. Because of what we have all learned from Bob Rogers – which comes out of what Bob learned from Disney and Buzz Price – our charrette process is the best there is. We do a full 2-day workshop with the client/stakeholder to uncover the heart of this project. Clients have strong stories and those are the differentiating factor. After we get everybody’s input and understand what is driving the project forward, there’s a bubble diagram that gets done. From that flow the concept and master plan. We go back to that original diagram and it remains true to the end. That thinking and understanding of what story you are telling, and how it works for that particular place and vision are the roadmap to the project. We make sure at end of the workshop that there are a mission statement, objective statement and theme statement. The theme statement is focused on design intent. If something doesn’t fit, it doesn’t go in. You take that and make a great master plan.